I injured my hand riding my kid to school last week – I inadvertently smashed my left hand into a trash can parked in a bike lane. The can was too far out in the bike lane to pass between it and the cars driving by. I tried my luck threading a dangerous needle: a gap between a parked car and an illegally positioned trash can. Someone in a parked car could have opened a door into us (my kid rides in my bucket bike). The other danger when threading this needle is smashing into the trash can – which is what happened to my left hand. This happened on a street upon which I have often stopped, dismounted, and politely repositioned trash cans. I have posted stickers on the cans blocking the lanes – informing can owners that it is illegal to block the roadway with them (bike lanes are legally part of the road). Finally, now that I have been injured thanks to the continued rude, dangerous, and inconsiderate behavior of my neighbors, and finding no reprieve from the LA City Bureau of Sanitation, it’s police officers, the LAPD, nor the highest level of city government; now I have found a way to fight back that matches the inconsiderate nature of this crime. Sidekicking cans has not been effective, in case you are wondering. People assume other motorists or the trash collector simply operated with an assumed level of incompetence and plowed into their cans. 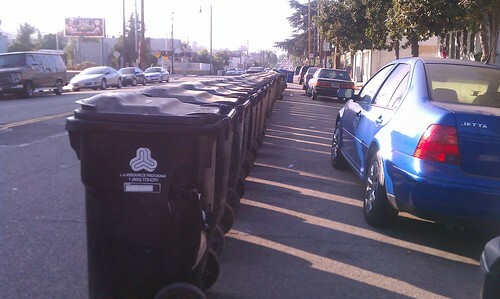 They place them back in the right of way the next trash day. My new hypothesis is to give bike lane blockers a taste of what it feels like to have your life endangered by someone inconsiderate of the needs of others. Now, I grab trash cans and drag them one or two blocks and dump them wherever I feel. Let me tell you: it feels great! I tried this strategy for the first time this week in front of my kids school. The can that wrecked my wrist got dragged to the corner and shoved against the curb. A good 100′ from where its law breaking owner had left it . I got my first piece of customer feedback just this evening when an obese man, in a dirty pick up truck, tried to berate me after seeing me grab a trash can positioned in the outer edge of the bike and dragging it two whole blocks before releasing it back into the wild. My reply to his seal like barking and pathetic engine revving?? The big baby was beside himself. His trash can was moved by someone who did not care about his convenience. The outrage! He might have to take the needs of others into account now. The injustice! 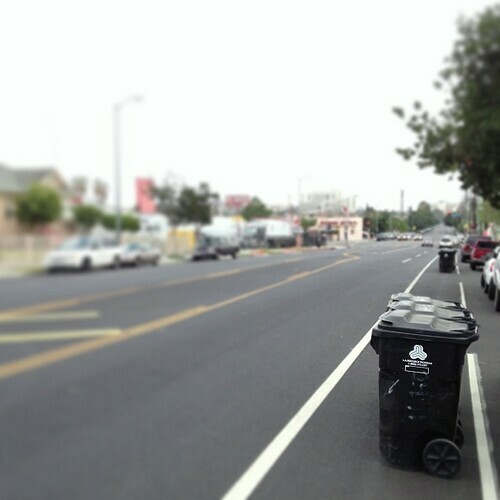 So, bike riders of Los Angeles: drag cans and let’s win this fight! If you’re tired of having your life put in danger by inconsiderate people take a long drag of trash can justice and let’s see if these abusers of the right of way can take a hint.